Just in on trade! VERY LOW MILEAGE! This 40VBH Bunk House model is in immaculate, almost-new condition! You will not find a cleaner, better taken care of pre-owned unit! This was driven on just a couple trips and then traded in for a larger motor coach that better suited the needs of the owner. Verona is a city famous for its beauty and timeless elegance. Renegade’s Verona motorhome possesses its own refined splendor and represents our pursuit to infuse travel-friendly luxury into every detail of these road legends. A host of expertly engineered features creates an inviting living space that also boasts the functionality that active families demand. And continuing the Renegade legacy of inspired performance, the Freightliner M2 chassis delivers 20,000 lbs. of trailer towing capacity.The Renegade Verona motorhome offers the flexibility, functionality and attention to detail you’ve come to expect from a brand defined by a passionate commitment to exceptional luxury travel. Renegade’s unrelenting craftsmanship is unmistakable. Beautiful Maple hardwood cabinets with soft closing drawers topped with polished solid surface countertops, along with stainless steel appliances and an 18 cu. ft. French Door refrigerator with ice maker add to the kitchen's elegance. · LPG Capacity 24.2 Gallons/80 lbs. Features 30"x80" Bunk Beds with Privacy Curtains! Call us with any questions: 800-766-1886, ask For Kale Elkins or Jim Elliott. 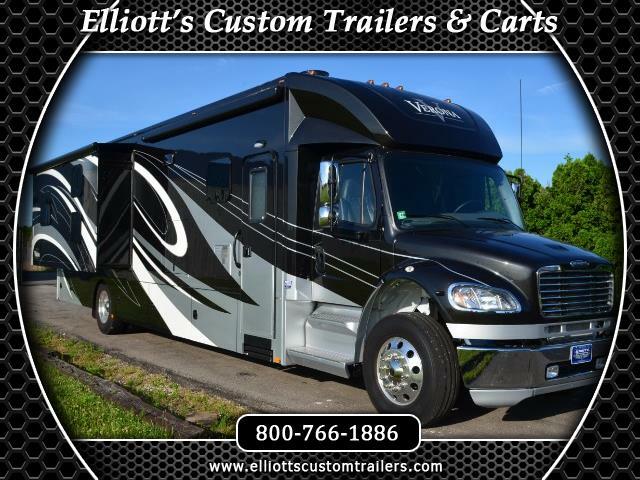 Check out Elliott's Trailers & Carts on Facebook at www.facebook.com/elliottstc to see more pictures of all of our Trucks, Custom Trailers and Custom Golf Carts or call us at 574-268-1886 today for more information or for a custom quote. We specialize in selling New & Used Custom Motorsports Trailers, New & Used Custom Golf Carts, New & Used Motor Homes, New & Used Toter Homes, several kinds of Used Heavy Duty Trucks. We are an Authorized Dealer for the following brands: InTech Trailers, Featherlite, United Trailers, Haulmark Trailers & Haulmark Motorcoach, and E-Z-GO Golf Carts. Elliott's is also an Authorized E-Z-GO Service Center and we have an extensive selection of golf cart parts and accessories. Stop in today! Message: Thought you might be interested in this 2018 Renegade Verona.